Dr. Chugay’s technique allows the most natural-looking results to be accompanied by the fastest recovery possible. He has appeared in the news on multiple occasions, discussing this technique. Its various elements have been presented to other surgeons at multiple conferences around the world with the hope of teaching others how to produce a better looking face-lift. HOW IS DR. CHUGAY’S VERTICAL FACELIFT DIFFERENT FROM STANDARD TECHNIQUES? The following revolutionary techniques are included in the Vertical Facelift: the well-known behind-the-ear scar is altogether avoided by making the behind-the-ear cut inside the back of the ear short and extended into the back of the hairline to minimize the scar visualized post-operatively. This is accomplished by creating small flaps inside the hairline. However aggressive or minimal your facelift needs to be, the flap technique in the Vertical Facelift will allow your hairline to be virtually unaffected. Many patients who have had prior facelifts suffer from partial or complete absence of sideburn hair. On many facelifts, the hairline is often raised. Dr. Chugay can correct these problems using the flap technique in the Vertical Facelift. A flap can be developed to bring forward and to recreate a normal hairline in front of the ear (from the temporal hair-bearing area of the scalp). WHAT MAKES DR. CHUGAY’S FACELIFT VERTICAL AND WHY? A temporal incision is made in the horizontal plane, hugging the hairline. The vector of pull is primarily superior (up), rather than lateral (sideways). This creates the premise for the vertical facelift and leads to a more aesthetically pleasing result. Have you seen that well-known artificial stretched look on patients who have had a facelift? This is due to lateral pull. Unfortunately, most surgeons still prefer lateral pull, as it is easier to accomplish. The lining of facial muscles is sutured upward instead of posterior thus reducing the laxity of facial muscle. Hairline unaffected. Most surgeons make incisions in the hairline to avoid visible scars. However hairline cuts often cause hair loss, which, in turn can make the scars even more visible. Using the Vertical Facelift methodology, Dr. Chugay makes incisions at the hairline. Thus, the scar is hidden; yet, the hairline is unaffected. Dr. Chugay’s Vertical Facelift Technique is More Aggressive Than Standard Facelift providing lift in the areas of the lip and chin areas in addition to lift in the cheek and neck. Thanks to Dr. Chugay’s skill and use of specialized blunt dissectors in the areas of the lip and chin, he is able to provide lift in areas that are routinely avoided by other surgeons for fear of nerve and blood vessel injury. Not everyone ages at the same rate. A great deal of the aging process relates to your tissues and what you do to care for them. 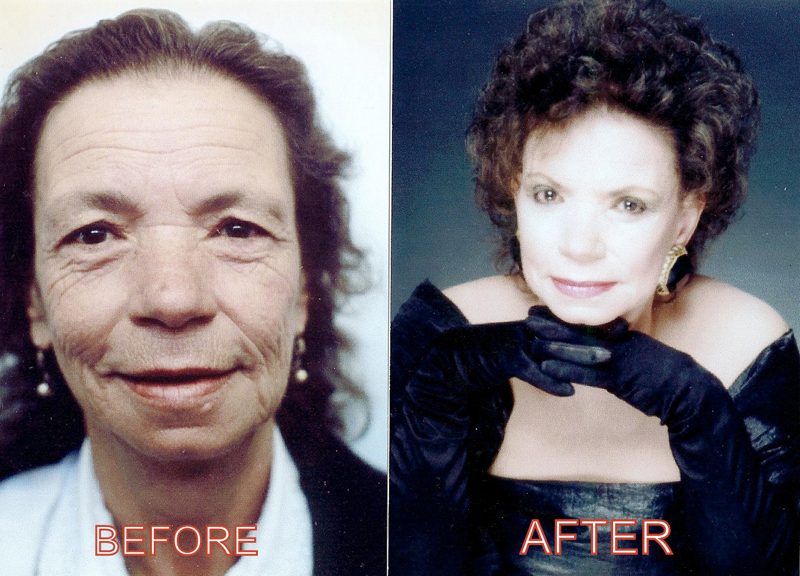 There is no magical age to make the decision to have a facelift. The appropriate time to have a consultation is when you no longer like what the mirror tells you. This may be in your 30s or your 80s. However, it is best to start at a relatively young age, before deep lines and wrinkles set in. It is then a matter of maintenance. There is no magic figure; however, a good estimate is 7-20 years. It is not uncommon for people to have several facelifts to maintain the young look. With Dr. Chugay’s Vertical Facelift technique, your results will last longer than with a standard procedure. WHAT IS A WEEKEND FACELIFT? CAN I GO TO WORK THE NEXT DAY? A weekend facelift is a term coined by the media. There is no such thing. There is, of course, microdermabrasion. However, it will NEVER give you the same results as a Vertical Facelift. Dr. Chugay’s Vertical Facelift technique is very aggressive, yet recovery is rapid. A facelift, nonetheless, is considered to be a major operative procedure. Like any extensive surgical procedure, operative incisions and complicated surgical stitching is required. Contrary to popular belief and despite some newspaper and magazine articles, this is not as simple as having your hair set or a getting a facial. The next day: you will see your new younger look. However, your younger look will not appear beautiful until swelling and bruising subsides. Please, see below for more information about healing. Immediately after the Vertical Facelift surgery, bandages are placed about the head and face for 24 hours. A scarf may be worn to cover stitches until they are removed. Keep bandages and incisions dry until sutures are removed. In the Vertical Facelifts, patients can expect some swelling of the face and eyelids and some discoloration is common with any type of facial surgery. This is most notable on the second and third days and diminishes in approximately one week. However, this also depends on your type of skin, age and healing ability. Make-up may be applied over the skin of the face up to the edge of the surgical scars approximately seven to 14 days following the facelift surgery. No hair coloring or stripping should be performed until Dr. Chugay gives you permission. Other hair treatment procedures may be carried out approximately two weeks following surgery. Do not allow anyone to pull on your hair or roughly massage the scalp. A hair dryer, if used, should be set at medium to cool heat. Do not wear earrings until sensation has returned to your earlobes. After your Vertical Facelift surgery, social activities may be temporarily limited. Strenuous exercise should be avoided for four to six weeks. Post-surgical questions should be directed to Dr. Chugay. It is unwise for you to accept advice from individuals unfamiliar with your specific operation.